Yesterday while cleaning the refrigerator, I found the unopened pack of strawberries that I bought last week before we left for Texas City. I was supposed to snack on them during our trip but I forgot to put them in the cooler. I was sad to find them overripe! I really hate food going to waste, so I thought of something to use them with. I still have some strawberry jam that I made a week ago and there's still more done a dozen of strawberry ice candy in the freezer, so I thought of just making strawberry shake. But the girls said no because they just had snack. Then I remembered seeing a panna cotta recipe at Alchemy In the Kitchen. After checking the ingredients I have, I decided to just make this dessert, which Clarise and Cherlin called "super yummy". 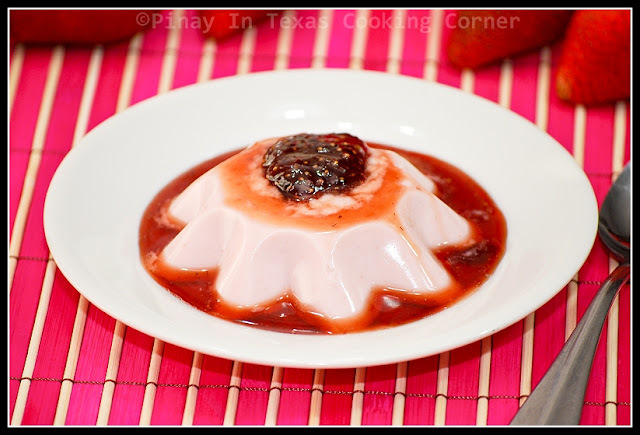 Inspired by Alchemy in the Kitchen's panna cotta, I came up with my version of Strawberry Panna Cotta, and I used my homemade strawberry jam as topping. I was so glad with the outcome! I saved the strawberries from going to waste and we all enjoyed our tasty dessert! 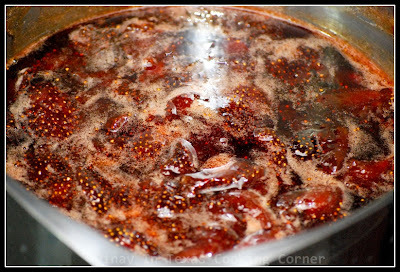 For homemade strawberry jam, click here. 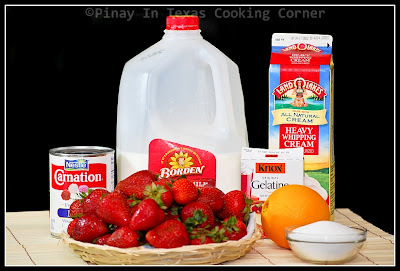 1.1 Blend strawberries, evaporated milk, orange juice and sugar in a blender until very smooth. Pour through a fine sieve into a bowl. Discard solids. 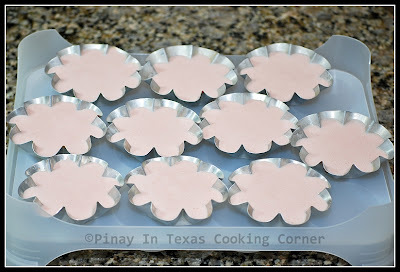 1.2 Sprinkle gelatin over milk in a small bowl and let stand 1 minute to soften. 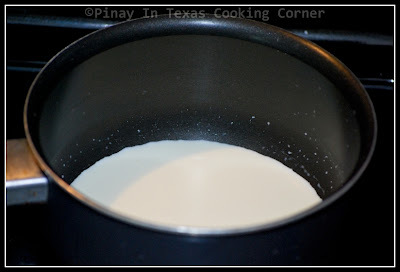 1.3 In a saucepan, bring cream to a boil over low heat. Remove from heat and add gelatin mixture, stirring until gelatine powder is dissolved. 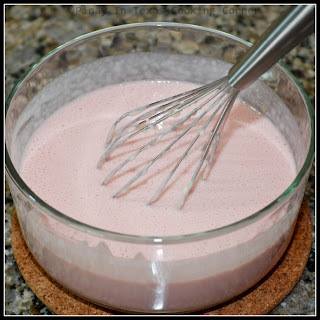 1.4 Whisk cream mixture into strawberry purée until well bleded. Pour into molds. Chill until firm for at least 3 hours. 2. While waiting for panna cottas to stand, make homemade strawberry jam. Allow to cool down to room temperature. 3. To serve, run a sharp knife around the edge of each Panna Cotta and unmold each onto a serving plate. Pour about 1 Tbsp homemade strawberry jam onto each panna cotta. Garnish as desired. That looks wonderful and such a beautiful color. 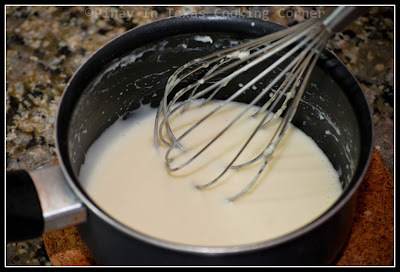 I've always loved panna cotta but thought it would be to difficult to make on my own. This looks so good. You have inspired me to try it. saving this one for a night I want to make dessert! This is really elegant plated up-stunning picture. Great for summer, nothing like an ice cold strawberry dessert! Who knew panna cotta was so easy to make at home! Love this recipe! The pics are drool worthy. 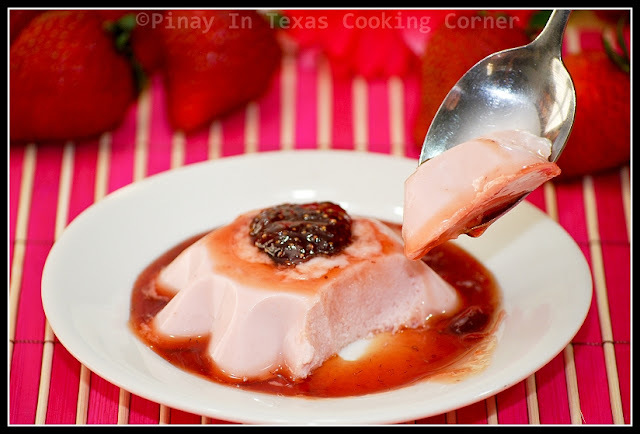 I LOVE panna cotta, will be trying this soon! What a great way to use ripe strawberries! 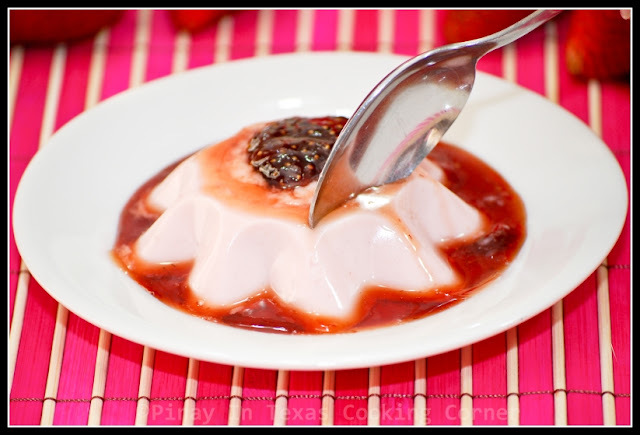 Oh, I love panna cotta - and this version looks delicious! Oh dear...this is so beautiful, and looks really tasty! Thanks for sharing, and have a wonderful night! Oh, Tina, that's incredible!! The recipe is out of this world. I’m in love with it! I'm totally making that when I get home! Looks delish! following you back! I'm totally sold by this beautiful and delicious dessert! You make great food and dessert and I don't know how you come up with time with two kids! Homemade is the best! This looks delicious, thanks for sharing the recipe! This is beautiful! Panna cotta with strawberries sounds heavenly!